Okay, so I had this whole blog post all typed up, and it was witty and smart and very insightful... and then, well, I erased it. As you know, I'm a total quitter so losing a perfectly usable post made me throw in the towel. I couldn't rewrite it, and I couldn't bring myself to write about something new, because that's just wasteful. In situations like that, the most logical solution for me is to quit. Well, I pout first, then quit. Buuut, I'm back in the saddle because Laura Belden Cook threatened to take away my baby if I didn't. Speaking of my baby... I am so pleased to report that Mr. Jaylen is adjusting nicely to his new hearing aids (or his "helppity helpers" as we may or may not call them around the house.) If you haven't checked it out yet, the video that I posted of him hearing fully for the first time is worth a look. It was such a precious moment to see him looking over his shoulder trying to figure out what and where that noise was! The ride home from the audiology appointment was adorable. I sat in the back of the van so that I could watch Jaylen's reactions, and it was so sweet to see him discover sounds for the first time. He was trying to sit forward in his car seat, straining to see the cars pass. It was as if he just realized that cars move and make noise! I think this whole time he thought that we just get strapped into a silver box that shakes around for a while and then spits us out at grandma's. He seems confused by some sounds and excited by others, and placing sounds will probably be a bit of a challenge for a while, but overall he is adjusting very well. Originally, the audiologist told me to plan on doing nothing for two weeks except putting hearing aids back into my child's head. In the two weeks following his appointment I had our annual Back-to-School-Girls-Only camping trip (Jaylen and his helppity helpers not included), getting the Harper ready to go to his first day of kindergarten, Marlie's birthday, the first week of school, adjusting all of them to a new schedule, tons of orders to fill (including a wedding), plus a zillion other things to do. I wasn't sure how I was supposed to cancel all of that to solely be on hearing aid duty, but it all worked out because Jaylen has literally not touched the hearing aids one single time. I don't know what it is about that kid but a) he's awesome and b) everything he does for the first time, he acts like its old hat. He just plays it cool and acts like he's been doing this all along. It's not like he hasn't noticed them, it's just that he is awesome at keeping them in. We can tell that he is noticing a difference because he is responding to sounds that he would normally not even blink about. The biggest and best difference is how vocal he has been! He can definitely hear himself... and he likes what he hears because when those puppies go in, he jabbers and coos and squeaks and squeals like it's payin' the bills. It has been a fun, and relatively easy adjustment, especially because we won't really do much differently. His speech therapist/teacher of the deaf still feels that continuing to use as much sign language as possible is going to be the best chance for him to develop language. She also said the we are excellent students, very "motivated" and that I have *sensational style. *The part was a lie, but the other stuff made me feel so good, I didn't want it to end. Anyways, the nice remarks gave Tom and I the courage to really dig deep and learn how to sign an entire book. Who cares if it's Brown Bear, Brown Bear, What Do You See? We can sign a whole entire book! I actually made a group of children sit down and watch me perform, and I have to say... the two year olds dig my stuff. 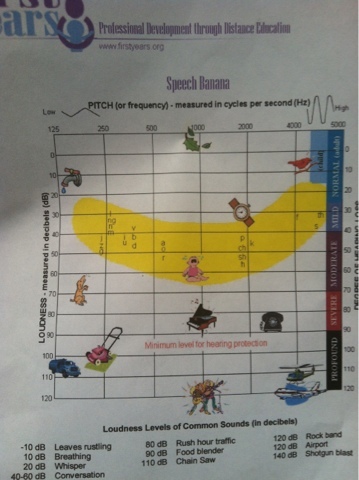 Above is the "speech banana" which shows all the speech sounds (letter sounds) that fall in the mild to moderate hearing loss category. Without amplification Jaylen would not be able to hear anything on or above the banana. As you can see, his speech development would be very challenging without any of those sounds available to him. You can't learn to speak by hearing a lawn mower. So, we are thankful that he appears to be hearing everything in that yellow section... and, we believe, even some of those beautiful, soft sounds at the top that we take for granted. When we brought him home with his hearing aids for the first time, we got him out of the car and he looked right up at the trees and watched with wonder as the leaves rustled in the breeze. Every single appointment, the countless hours spent in waiting rooms, all the parking garage fees, and co-pays and specialists and tears and evaluations... the waiting and the stress and the wondering, all of it, every bit was worth it just to see the smile that spread across his face because he could finally hear the whole banana.